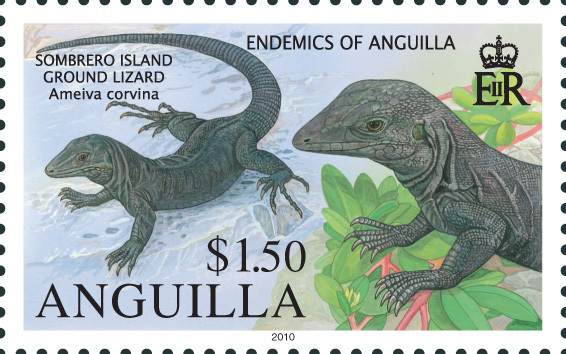 Anguilla´s fascinating environment is again brought into focus with the release of the island´s first stamp issue for 2010, “ENDEMICS OF ANGUILLA”. 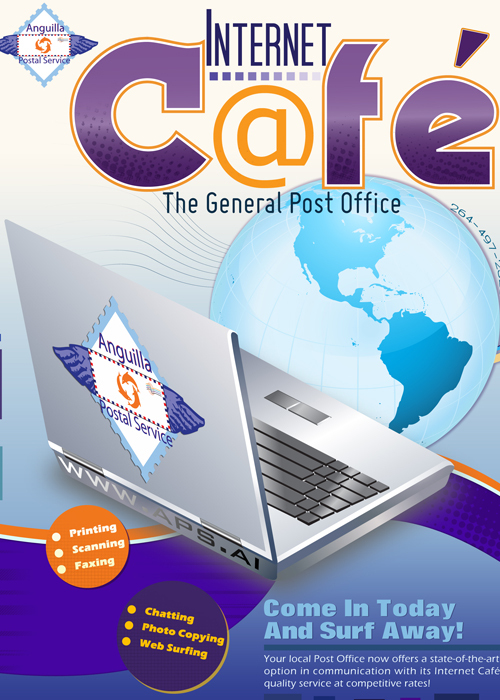 The Anguilla Philatelic Bureau in conjunction with the Anguilla Stamp Advisory Committee (ASAC) has undertaken to document three of the island´s endemic species on its postage stamps. These are: Anguilla Bush (Rondeletia anguillenis)’ Little Scrub Island Ground Lizard (Amevia corax) and the Sombrero Island Ground Lizard (Ameiva corvinea). 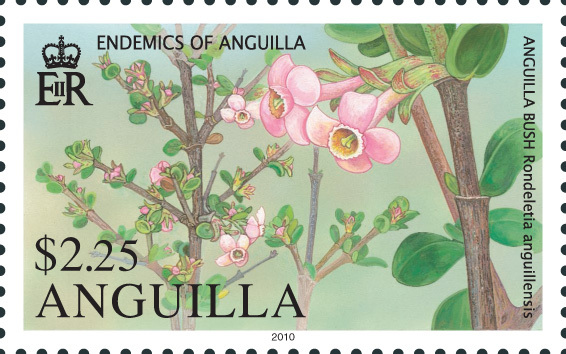 With growing global emphasis being placed on conservation of the earth´s fragile environment, it is timely that specific attention is being paid in sensitizing our community to the island´s little known endemic species of flora and fauna through the medium of the postage stamp. 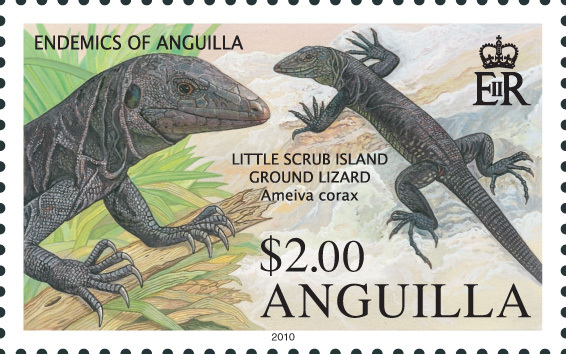 The introduction of this stamp issue is intended both to educate the public regarding the existence of these creatures and their importance to human existence as well as create a greater awareness of the need to conserve and protect ‘all creatures’ great and small´. Little Scrub Island Ground Lizard (Ameiva corax) This primarily dark coloured reptile is found through out Little Scrub island but is concentrated in two main areas. The male is slightly larger than the female and grows to approximately five inches from head to body while the female attains the length of about four inches. The tails of both males and females are twice as long as their bodies. The Ameiva corax ranges in colour from slate grey to black usually without any discernable pattern’ however a few individuals may exhibit faint remnants of stripes and spots. Little Scrub supports scares prey for the lizards who feed mainly on birds´ eggs during the nesting season’ flowering cactus and scavenge for bait left by fishermen. Sombrero Island Ground Lizard (Ameiva corvina) The Sombrero Island ground lizard at a glance resembles the Scrub Island Lizard. These are also slate grey to black in colour. The Sombrero lizard is different in that the body is elongated with a pointed head which is not well defined from the body with a long tail. The males grow to a maximum of five inches from head to base of the tail and the females are slightly smaller. Ameiva corvina is found throughout the island but are concentrated near the island´s lighthouse because of a ready source of food for scavenging from the lighthouse keepers who until recently lived on the island. Pink Orchid (Epidendrum kraenzlinii bello) This exotic wild orchid is one of two known to grow on Anguilla. The plant tends to exist parasitically but can also be found growing on rock pavement. Its delicate slender stalk bears several lovely, deep rose coloured flowers at the top. The Pink Orchid is found sparsely on the eastern end of Anguilla but has a greater concentration on the south centre of the island. This miniature plant is presently under threat of extinction due to Tourism related development including large resorts and gulf course projects. Anguilla Bush (Rondeletia anguillensis) Anguilla´s lone endemic plant, Rondeletia anguillensis is a small stiff shrub with miniature green leaves and pink trumpet shaped flowers. The Anguilla Bush seldom grows over three feet tall and eek out an existence in small holes found in limestone pavements. The shrub grows predominantly in the eastern region of Anguilla but is increasingly threatened by habitat loss and landscape fragmentation due to Tourism driven development. Studies have been made on the distribution of Rondeletia anguillensis by the island´s Department of Environment (DOE) for future conservation planning decisions.